Amongst all the hustle and bustle of the present "season," I am trying to consistently sit down and weave some of these tea towels every day that I am home. 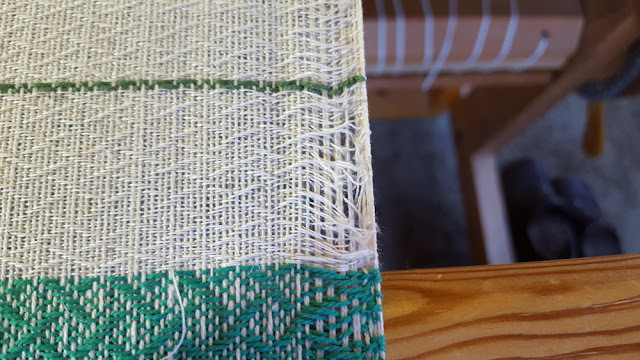 The warp is cottolin, and combination of linen and a soft cotton, and the weft will be both cotton, and colored cottolin, depending on what I have on hand and what will look good and function well. I love this pattern, with all it's angles and interwoven appearance. I just completed this towel woven with a deep rose cotton thread. 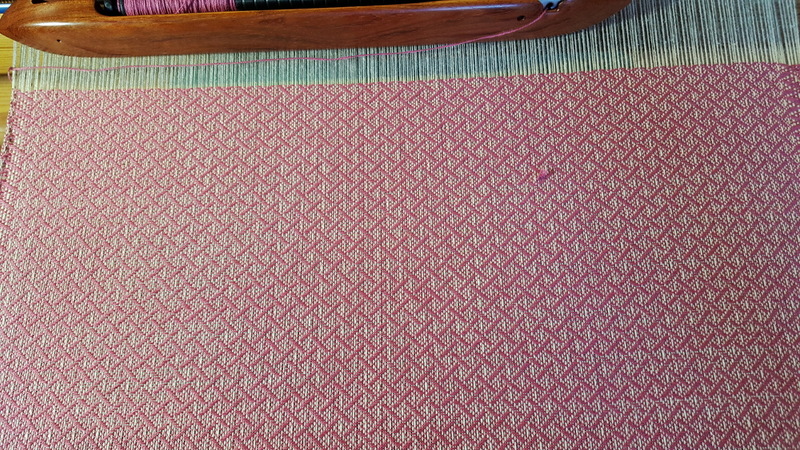 I love the way it looks and will definitely weave another on this warp. You can see a small knot that got by me, but it will be replaced and repaired prior to wet finishing. I've also finished an emerald green towel, which was a nice bright contrast to the grey day outside. Unfortunately, I began to have some issues with my temple, which is a "stretcher" with very pointy teeth that is placed at the edges to keep the cloth from drawing in or becoming less wide. I use a temple not only to help the selvedges, or edges, stay nice and straight, but especially because having straight selvedges allows the beater to beat the weft in place evenly across the whole cloth. 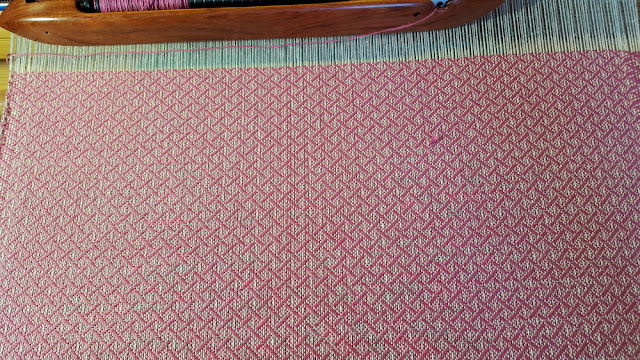 I thought I was using my shortest temple, which measured just to the edges of the warp, even though ideally a temple is supposed to be slightly shorter than the width of the warp at the reed, or beater. Those are many broken weft threads. Sigh. You can also see how pulled apart the edge warp threads are. I may be able to hand stitch that edge back together so the towel is serviceable, but obviously it is not sellable, so I will weave another green towel next. The rose towel went ever so much more smoothly, because I did find my shortest temple, which adjusts perfectly for the width of these towels. No more fighting, just smooth weaving. And another towel for my rejects drawer!